Beginning with Oracle Database 12.1.0.1.0, DBAs started to work with Pluggable Databases. There were some large migrations of several databases from 10g/11g to 12c where they were consolidated into a new Oracle Database Container using several Pluggable Databases. However, running operations in several Pluggable Databases became a problem, since people had to login into every Pluggable Database and to run the required script or SQL Statement there. To avoid causing people to spend too much time doing this kind of work Oracle introduced the Perl script “catcon.pl”. Basically catcon.pl receives either a script or the text of a SQL Statement and executes it in the Pluggable Databases that we specify, even in PDB$SEED and CDB$ROOT, depending on which flags of catcon.pl are used. In the following image we see a script received by catcon.pl, and catcon.pl executes the script in CDB$ROOT and PDB$SEED if the flag “-S” is used as well as in the rest of Pluggable Databases. Using catcon.pl considerably reduces the time spent on running scripts across several databases. One of its advantages is that you can filter the pluggable databases where you want to execute the script or SQL Statement by using “-C” for exclusion of pluggable databases and “-c” for inclusion of pluggable databases. You can also specify the order of the pluggable databases where the script or SQL statement has to be executed. The following script contains a CREATE TABLE statement, an INSERT statement, a commit and a SELECT statement. All these operations use the same table, C##DGOMEZ.COUNTRY. When the flag “-S” is not used, catcon.pl executes the script or the SQL Statement in all the containers including CDB$ROOT and PDB$SEED. Also all the objects created by catcon.pl are created as “ORACLE_MAINTAINED”, which means that those will be objects owned by Oracle and which cannot be modified by any database user. I don’t recommend using this method to create objects for the business or our application schema; this method is used to run perhaps a script for patching, migration, or any other task that touches the data dictionary or any other aspect owned by Oracle. Executing catcon.pl. The flag “-d” specifies where the script is located. The flag “-l” specifies the directory where all the logs will be created. The flag “-b” specifies the prefix name of the log files that will be generated and finally the value with the name of the script that will be executed by catcon.pl. As you can see, the script was executed and it created the objects as “ORACLE_MAINTAINED”. 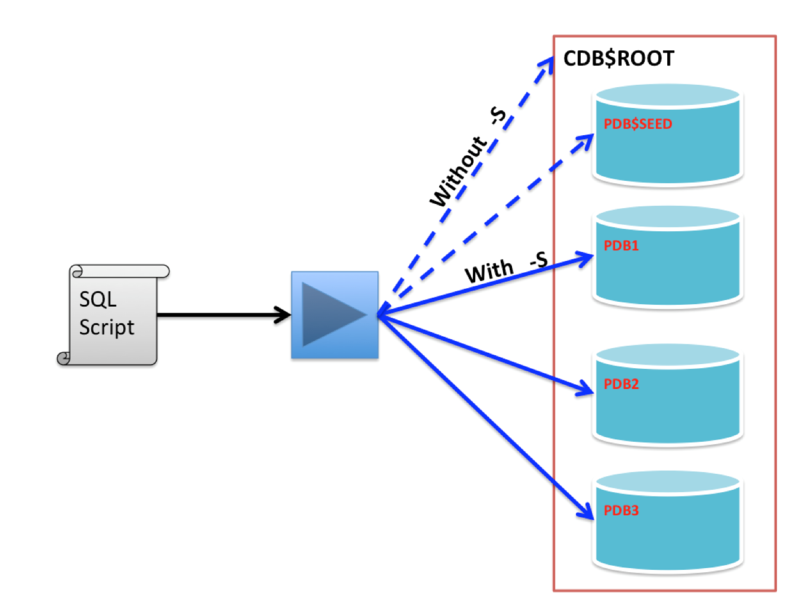 The script was executed in CDB$ROOT and also in PDB$SEED. In this example, the script failed in PDB$SEED because the schema c##dgomez didn’t exist within the PDB, and catcon.pl couldn’t create the table. I recommend using this flag when you are running either a script or SQL Statement that create objects for your business application schema like the Script #1 or the Script #2 that I created in this article. In other words, when you are running operations not related to patching, upgrades, or to the data dictionary. When the flag “-S” is used, catcon.pl doesn’t execute the script in CDB$ROOT or in PDB$SEED. NOTE: I manually created the table in CDB$ROOT, just to make the CONTAINERS clause work. In the following example I am using the flag “-c”, which is useful when we want to use “inclusion”. We have to provide the list of the PDBs where the script will be executed. In this example, the script will be executed only in PDB1 and PDB3. I will use in this example the script #2, which performs only an INSERT operation. When the multi-tenant architecture was introduced, the Perl script catcon.pl was also introduced to help running frequent scripts in multiple pluggable databases. In this article we saw some examples where different flags of catcon.pl were used, such as the flag to include or exclude PDB, the flag to execute a script as if it was provided by Oracle, and when we want to create objects for our application schema. There was also an example in which the order of PDB was provided. The Perl script catcon.pl is certainly useful to avoid wasting too much time executing the same task in every PDB.